Masterline MVX2 Dual is optimized for state of the art signals such as dual DVI (or VGA), analog audio and USB 2.0. The transmission distance of 1640 feet over a 2-strand Multimode fiber-optic cable is completely lossless. MVX2 Masterline Dual KVM extender supports resolution of 1920x1200. Optionally, you may connect the local (CPU) and remote (CON) units to a 1GB Ethernet network switch, which will in turn support a total point-to-point extension distance of 3280 feet (1000m). An MVX2-MO USB 2.0 memory option is available (purchased separately) supporting USB memory stick and USB hard drive. When enabled, this option allows the use of a USB memory stick or a USB hard drive for transferring data. 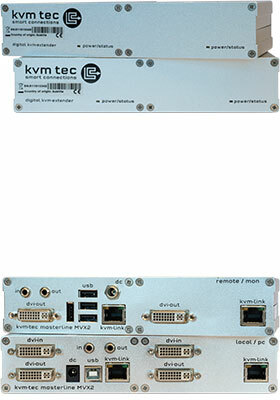 With the optional MVX2-SWO matrix switching system upgrade (purchased separately), MVX2 can be used with a dedicated 1GB Ethernet network switch to create one-to-many and many-to one configurations, or even a complete many-to-many KVM matrix switching system without any additional hardware. MVX2 on-screen display (OSD) system is then used to control the connections of your matrix.